3 Beds | 2/1 Baths | 2,368 Sqft Disagree? 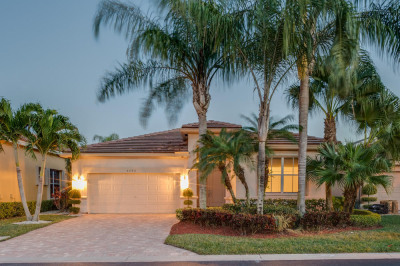 Stunning golf & lake views surround this beautifully maintained, bright & airy, mediterranean ranch-style 3BR/21/2BA home located on a quiet cul-de-sac in Wycliffe Golf and Country Club. This gorgeous home features volume ceilings with recessed lighting, 18'' tiled flooring, huge windows and sliding glass doors with custom window treatments, custom shelving, light fixtures, and mirrors, and an updated gourmet kitchen with granite countertops, white 42'' cabinets, a large center island, and GE appliances. The master suite has His & Hers walk-in closets, patio access through its sliding glass doors, and a resort-style master bath. The covered screened-in patio has paver flooring and overlooks the golf course and surrounding lakes.